We are twenty-two days into our Interiors Advent Calendar and it seems to be getting more inspiring, more beautiful the closer we get to Christmas! From our past experiences with Christmas shopping for design pieces, we’ve learned that nothing works better as the perfect finishing touch to a study or living space than a truly special chess set. For the twenty-second day of our Interiors Advent Calendar, we are hereby thrilled to show you this year’s “piece de resistance”. 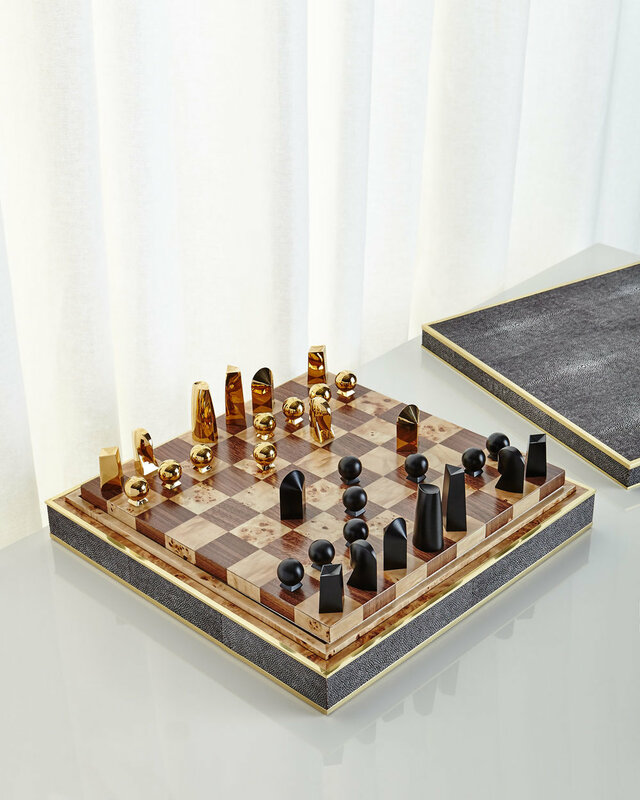 Aerin’s Shagreen Chess Set can be purchased from Harrods, and it is an absolutely stunning work of design. Presented in a Shagreen box, the chess set features inlaid burlwood and embossed shagreen with brass hardware. It is a timeless creation that retains the traditional chessboard style, with a contemporary twist given to the chess pieces, designed in streamlined shapes that beautifully complement the black and gold aesthetic. Complete with elegant brass detailing, this Aerin chess set could easily become a gift for more than one generation, one that will make Christmas truly memorable for someone special. Unique chess sets are not easy to come across, and we were genuinely excited to find this hand-crafted work of art at Harrods this year—and a serious contender for our “Potential Family Heirlooms” list.